We do NOT accept money orders or foreign cheques . Isle Of Wight Chessel Pottery Bell. Condition is Used. 5” in height with blue/green flowers and white dove. Downsizing my collection. Perfect used condition. Marks: Marked on the base L (For Lowerdown set up by David Leach. Size: about 8.5 cm tall. ). New listingVintage Aldermaston Pottery Shallow Bowl by Juliet Wilson (Harkness) 8 3/4"
Juliet Wilson (now Juliet Harkness) worked at Aldermaston from 1969-72. NEW Rare Yare Hatching Dragon. Original Yarmouth Studio Pottery Green Box - Immaculate. Guessing it would be hard to find one that is actually still new and never been displayed with it’s perfect box. A large Marie Whitby Guinness No. 12 bus studio pottery sculpture. It's signed MW 1975 on the back of the bus and the Ashwell pottery label together with a handwritten signature and 1975 date are on the base. STUDIO PORCELAIN POTTERY BOWL. DAVID WHITE 1934-2011. A superb hand thrown celadon glazed bowl , the body is white stoneware or porcelain - quite thickly potted. The glaze has a very fine crackle to it, and the rim is coloured brown....No makers marks - quite possibly fairly modern Korean or Japanese - but such a lovely bowl... Size: 18.5 cm wide, 7.8 cm high. Weight: 676 grammes before packing. Hence low price of all 3 pieces. Still 3 lovely hand built and hand thrown pieces of studio pottery. Height of bowl 3 3/8" ( 8.5cms ) x Width approx. 5 5/8" ( 14.5cms ) at widest part at the top Tiny bit of glaze loss on top rim. A gorgeous studio pottery jug with handle, signed underneath with the potter’s initials R.E. Circa 1960’s. 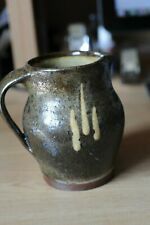 BEAUTIFUL COLDSTONE STUDIO POTTERY SLIP WARE DISHE. TREACLE BROWN. BEAUTIFUL ITEM. Unsure as to the date of this item but possibly as late as the 1990's. ANGLO JAPANESE STUDIO POTTERY STONEWARE VASE. GREAT STUDIO POTTERY. VERY GOOD CONDITION there are two small missed unglazed area on body to report. Studio pottery jug from the Abuja pottery in Nigeria with the impressed mark of Bawa Ushafa who was the first trainee and the senior potter of the original 10 students who were taught by Cardew. It bears the Aindow brothers mark to the base and the original sticker. Unusual Kendal Studio Pottery jug with a round raised plaque for the CARLISLE PAGEANT OF MOTORING 1976. Unusual Shaped Bud Vase/Pot in Dark Blue with Impressed Mark AS on base. In Excellent Used Condition No Chips 🍟Nibbles Cracks or Crazing. Height 10cms, diameter at top 2cms, at waist 8cms and at base 6cms. Photos taken under artificial light so colour may appear different from the actual item. Reasonable offers considered.I am happy ☺ to combine postage if you find other items you wish to purchase. B14.no379. A fab hand made and glazed vintage milk jug. Potted in stoneware between 1968 to 1973. Two potters at the studio around this period. Potter's mark on the base. In perfect condition. See all the photos for proof of condition. Measures 9.5cms tall UK postage only. Use global shipping programme for international postage through ebay. Will be proof of postage and GPO tracked. Postage includes postage and packaging. Vintage 1960s Studio Art Pottery Large Footed Dish Marked AP Judith Partridge? 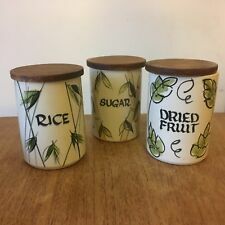 Janet Leach 1918-1997 - Rare Sake Set c1970s. Dark Stoneware with white glaze. STONEWARE RIBBED DESIGN STUDIO POTTERY VASE. WITH INTERESTING GLAZE EFFECTS. WONDERFUL ITEM. MAKER’S MARK IMPRESSED TO BASE (SEE PICS). This is a fabulous piece of Studio Pottery with the impressed J.B. mark. This set of six triangular bowls are beautifully simplistic in style and design, able to be locked together to form a circle they are perfect for serving up a whole plethora of snacks and tapas. The beautiful minimal glaze along with the muted, natural colour way and shape really make these bowls stand out and are sure to look great on any table setting. THESE PLATES ARE IN GOOD ORDER, BUT THERE IS PAINT MARKS ON THE BACK?. THESE FISH AND SEA WEED TYPE OF PLATES LOOK GOOD TOGETHER AS THEY ARE SIMILAR OPPOSITES?. Vintage Aldermaston Pottery Shallow Bowl by Juliet Wilson (Harkness) 8 3/4"